At this summers scything events a challenge was issued (by Simon Fairlie) to find the best peening and sharpening champion for all Britain (& Ireland!). In the event the challenge was not answered: the key masters and teachers of the mysterious art of peening (they know who they are!) dissolved away into the damp mists of the levels that stretch out from Glastonbury. But the scythe ‘sharpometer’ was born, and as time passed some of those that formerly melted into the shadows did creep at dawn to test their blades whilst no one was looking – and the keeper of the ‘sharpometer’ did write their results on the leader board, oh yes! And here they are for all to view! But before I reveal all: what is the ‘sharpometer’ of which I tell; and more importantly what does it measure? 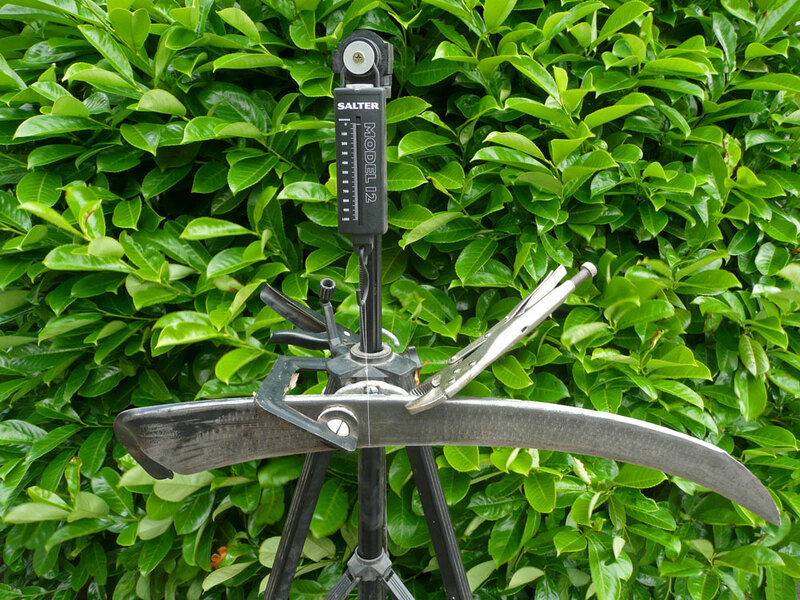 The sharpometer is really a simple device (made to look more complex for effect) which measures with a spring balance the force required (in grams) needed to cut a standard thread (Gutterman polyester sewing thread). The sharper and more perfect the very edge of the blade which contacts the thread – the smaller the force required to sever it. A brand new Stanley knife blade serves as a bench mark and needs a force of 160g. This test gives an objective spot measure of sharpness, but it is not a measure of peening or thin-ness of blade as it would be possible ( if more difficult), to put a short-lived sharp edge on an un-peened blade. 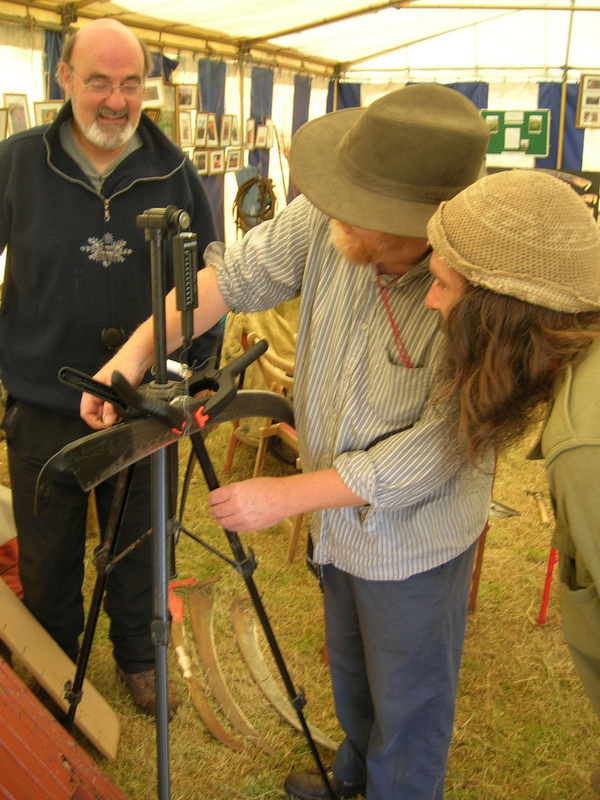 So how did the sharpometer results from the West country and from the Eastern counties scything championships turn out? First up a brand new ‘profisense’ blade fresh out of its wrapper from the Schröckenfux factory scored 500g (remember 160g = Stanley blade). Andy Coleman 230g, Beth Tilston 260g, Simon Fairlie 270g, Phil Batten 280g, Steve Tomlin 280g and Andy Marczewski 280g. Simon Fairlie 200g, Steve Tomlin 200g and myself Richard Brown 180g (‘best in show’ – even if I did create the sharpometer; result witnessed by Phil for all you doubters!!). Ded Kalaj at Wimpole 400g – after first round of blade preparation of borrowed blade. Chris Lambert also 400g – with an English patent blade he borrowed from me at Wimpole (whetted with coarse stone – English blades never peened). George Montague (at Wimpole) 800g after which he went back to his peening pony and must have improved on this to finish in the top 3. It only takes the slightest burr at the point of testing to make a difference. Simon Fairlie at one stage was able to claim “the best and the worst score within one blade”. In a pre-competition check I found my own blade was in the 250g (smug) category of sharpness – however just a few careful strokes of the finest stone raised it to 200g perfection. However none of this edge perfection translated into a stunning result in the (Somerset) field for me- on the contrary I was quite disappointed both with my personal time and quality. All this was fun and caused much light-hearted debate which at times was an entertaining distraction from the incessant rain that dampened spirits at Muchelney. But what does it mean and does it prove anything? My personal feeling is that edge perfection is probably short-lived once the blade contacts the grass and that in practice a blade that has been prepared well enough to easily hone to get 250g is probably fit for purpose. Assessment of the quality of peening is more difficult and would probably be functionally expressed by the amount of work you can do with a peened blade and maintain a reasonable sharpness score. I do not propose to write an essay on this or even summarise the views given during the first outings of the sharpometer (especially from those at the blunt end!) – I will leave that to you and your responses. Brendan surpassed all scythe results and the Stanley standard with a score of 120g with a leather stropped Opinel Efitte pocket knife – reportedly spending considerable time to achieve this samuri perfection – well done Brendan. Terry Pratchett’s character “Death” carries a scythe that is so sharp you can see the blue sparks of split atoms falling to the ground as it moves through the air. It is so impossibly thin (a few atoms thick at its edge) that it is completely invisible if viewed edge on. This entry was posted in Sharpening & peening and tagged peening, scythe blade, scything, scything festivals. Bookmark the permalink.